An easy go to resource. Helping teachers and home schoolers simplify Personal Finance lessons to K10 and older. 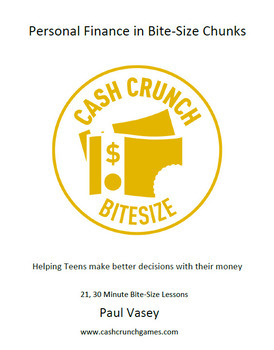 Saves time with planning and creation of materials and helps teens make better decisions with their money skills and habits. Simply read the lesson plan outline, print the reading and activity material and away you go. Activities are differentiated by outcome. 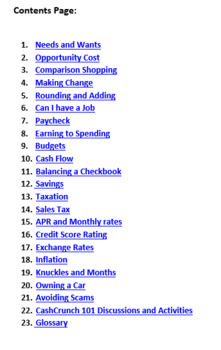 21 Personal Finance lessons in 30-minute bite size chunks. Includes brief lesson plans, reading material, activities, discussion ideas and glossary of terms. All lessons have been based around National Personal Finance Standards. 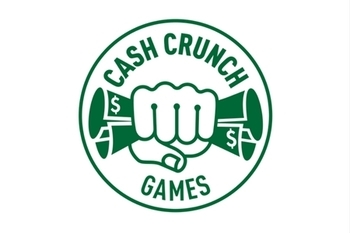 Can be used independently or in conjunction with the free personal finance game CashCrunch101, which can be found on the www.cashcrunchgames.com website. Written by a teacher for teachers. Saves you time and having to reinvent the wheel.